JNN 19 Mar 2014 Tehran : A sentence of death by stoning handed down against an Iranian woman convicted of adultery in 2006 will not be carried out, a senior judicial official said on Tuesday. The judgment, which drew widespread international condemnation, was overtaken by a separate death sentence on charges of complicity in her husband’s murder, which was commuted to a 10-year jail term in 2007, the judiciary’s human rights chief said. “The stoning sentence might have been raised in this case, but the finalized verdict, which was death by hanging, was for the murder not the adultery,” Larijani said in remarks carried by the committee’s website (www.humanrights-iran.ir). “We managed to get the consent of the victim’s family to forgo qisas (retribution) and people paid the blood money,” he said. Under Iranian law, if a murder victim’s family, in this case the children of Mohammadi-Ashtiani and her slain husband, forgive the accused, the convict can be either pardoned or given a jail term. “She killed her husband with the help of an accomplice and was sentenced to death by hanging, but in the international arena they said the death sentence was issued for adultery,” Larijani said, adding that the case was used by the West as “propaganda” against Iran. Iran’s judiciary chief Ayatollah Sadeq Larijani recently called on judges not to issue verdicts which could harm the Islamic republic’s image. Under the interpretation of Islamic sharia law in force since Iran’s 1979 revolution, adultery is punishable by stoning. But Tehran changed the law in 2013 to allow judges to order an alternative method of execution. 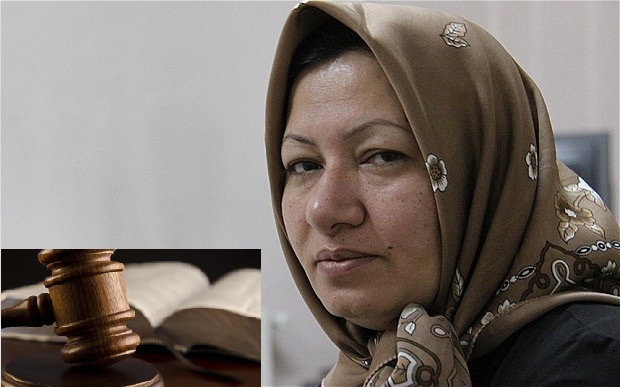 Mohammadi-Ashtiani was convicted of several counts of adultery by the original court in the northwestern city of Tabriz, notably with the man convicted of her husband’s murder. This entry was posted in Iran News and tagged adultery, Adultry, iran, Irani Woman, Mohammad Javad Larijani, Sakineh Mohammadi Ashtiani, Sentence for Adultry, stoning By Death. Bookmark the permalink. STONING TO DEATH THOUGH SPARED AND RIGHTLY SO IN TODAY ENVIRONMENT, IS SCARY ENOUGH TO THINK TWICE BEFORE ANY ONE VENTURES AGAIN .